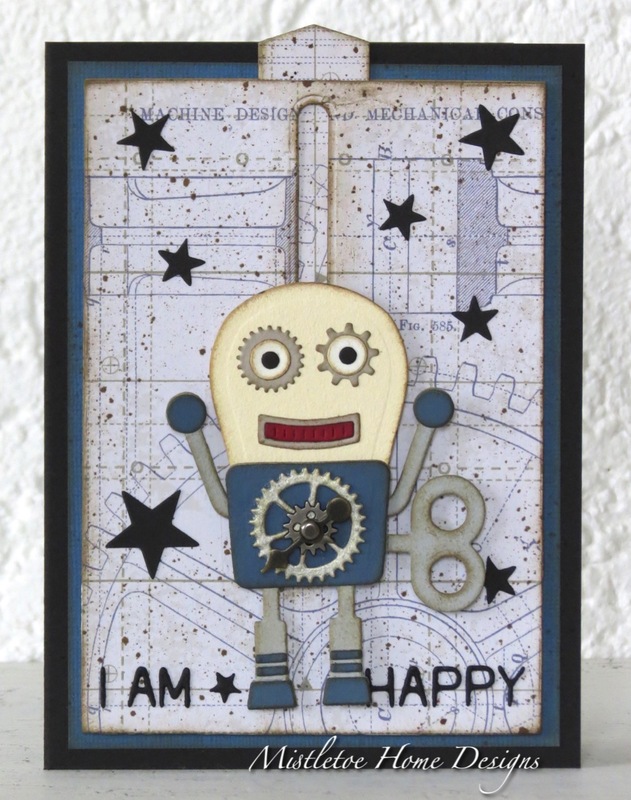 Hello everyone, let me show you my second card with a jumping robot which can jump higher than the earlier one as the sliding channel is longer here, on this card. 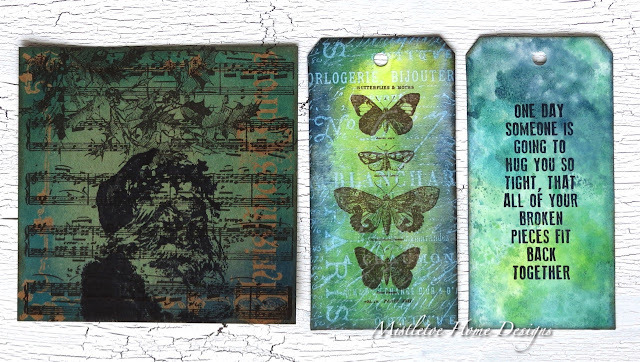 Idea-Ology Paper Stash, Dapper 12x12"
Last year a started a Tim Holtz Online Class, the Creative Chemistry 101. 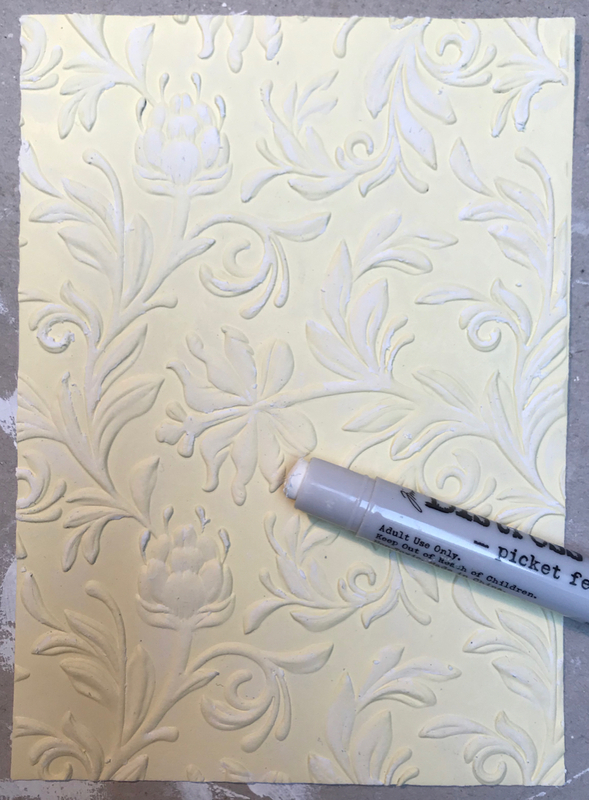 After reaching day 5, I got stuck because I needed a Kraft Resist cardstock which was a discontinued product. These papers are very hard to find or buy, mainly in Europe. But luckily I could purchase - I think - the very last 12x12" pad from Germany. Happy dance! And here are my makes of day 5. This Easter box is my second inspirational project for the April challenge of the Country View Challenges where I'm your hostess this month. 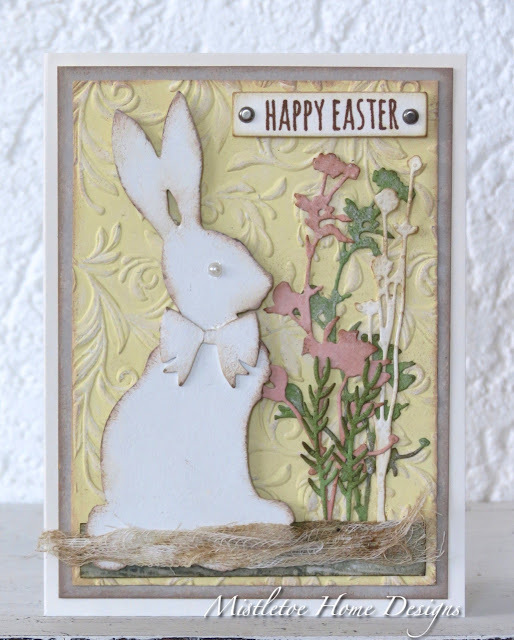 I chose a quite obvious theme - I hope you like it - Easter and/or Spring. 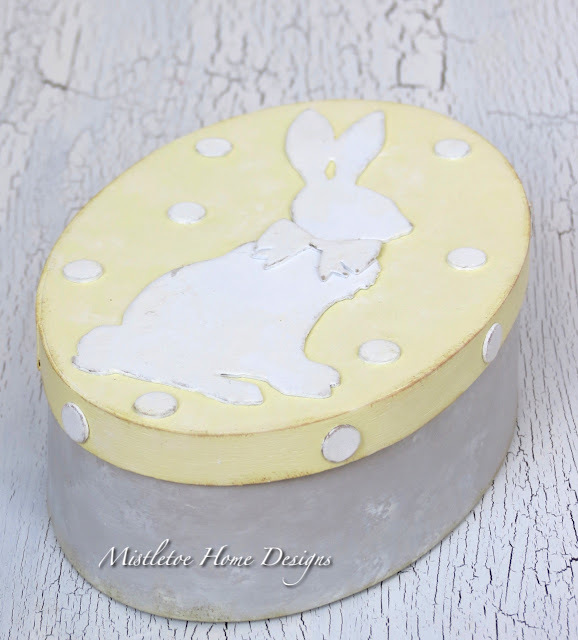 To begin with, I took an oval-shaped poplar box and painted them with DecoArt Americana paints. For the top, I mixed Ligh Buttermilk with a tiny drop of Pineapple. I put two coat of paints, but of course, I let the paint dry between the coats. I cut out the bunny with Sizzix Bigz die, Cottontail by Tim Holtz (664167) from grey chipboard. And for the dots, I used the Sizzix Bigz Die, Gadget Gears 1 and the middle of the smallest gear. 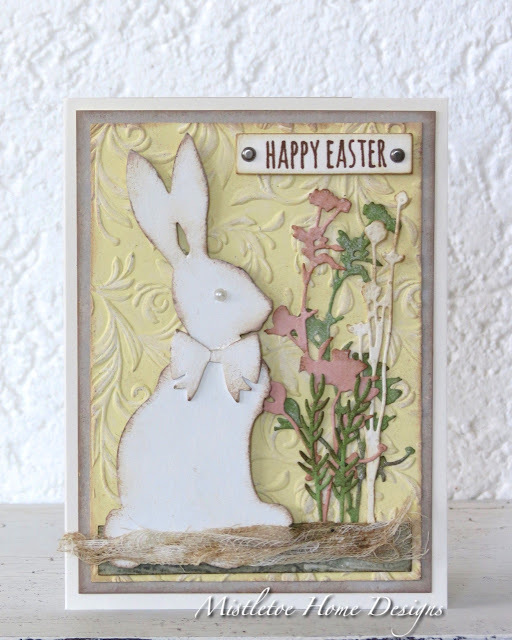 I cut them out from chipboard as well. I put an even coat of DecoArt gesso on the cutouts. After drying I painted them white. 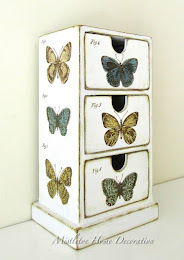 I let them dry, then with sandpaper, I sanded the edges of the die-cuts. 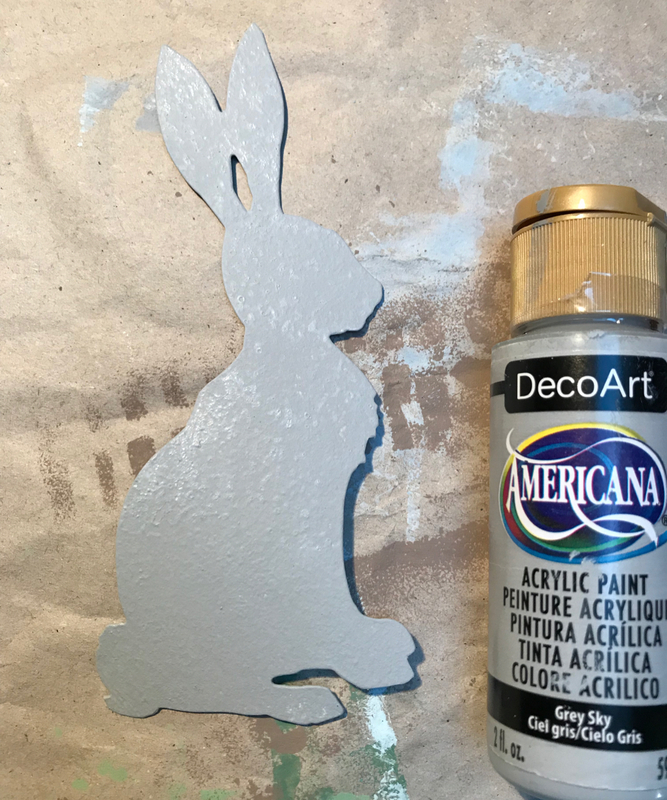 The bottom was painted with DecoArt Americana, Dove Grey colour. Here I also applied two coats. Now the next process was made with the top and the bottom as well: After drying I sanded the edges and inked with Ranger Archival Coffee ink. 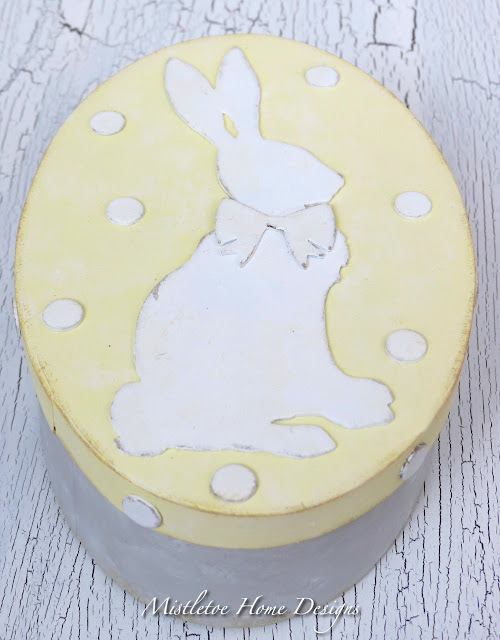 Then with a sponge, I tapped diluted white paint onto the surface to achieve a look like this. 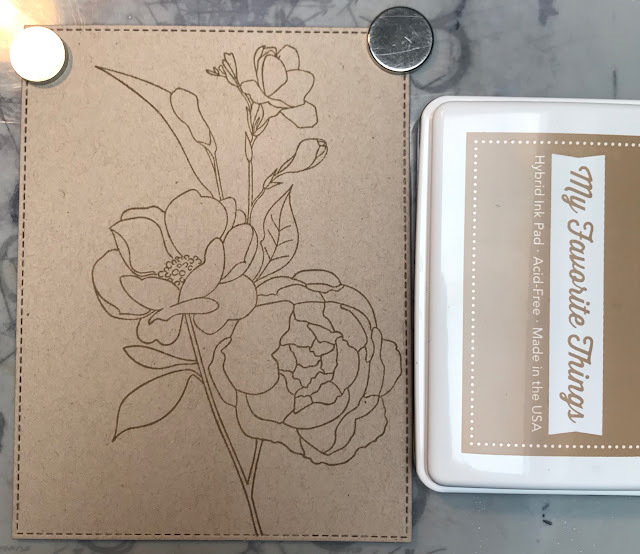 I glued the cut outs to the lid and my box was ready. I hope you like it!!! 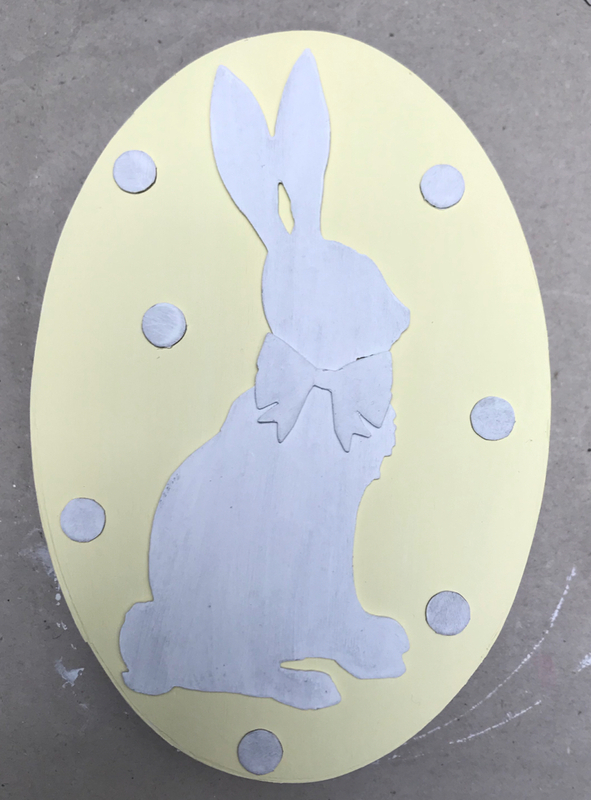 And if you have a project in the theme of Easter and/or Spring, please don't hesitate to join our April challenge where you can win a £20 voucher. Hello everyone, it's April and we have a new challenge at the Country View Challenges and this time I will be your hostess. 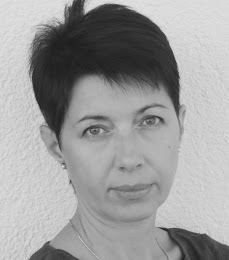 The theme is - what else? 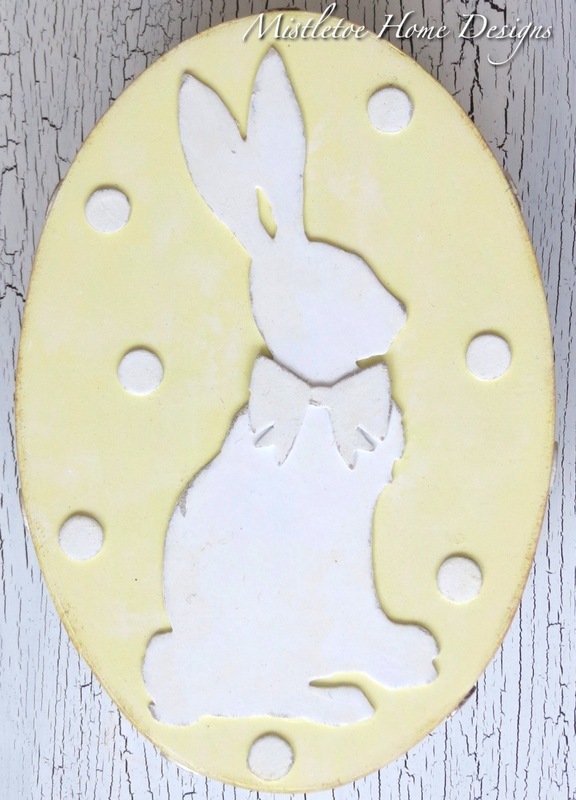 - Easter and/or Spring. I hope you like it! 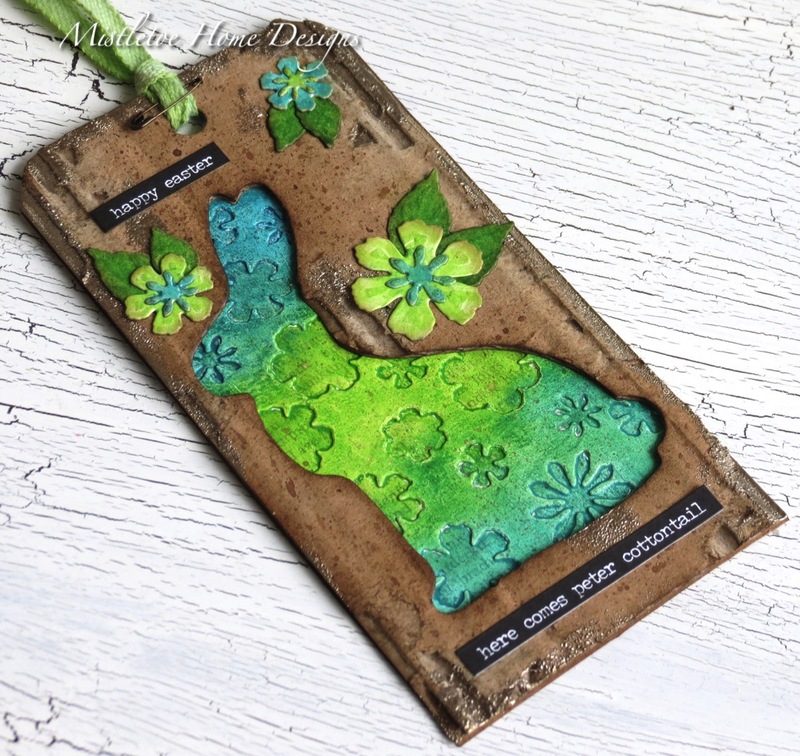 My first inspirational project is a card with the brand new die by Tim Holtz, the Cottontail. 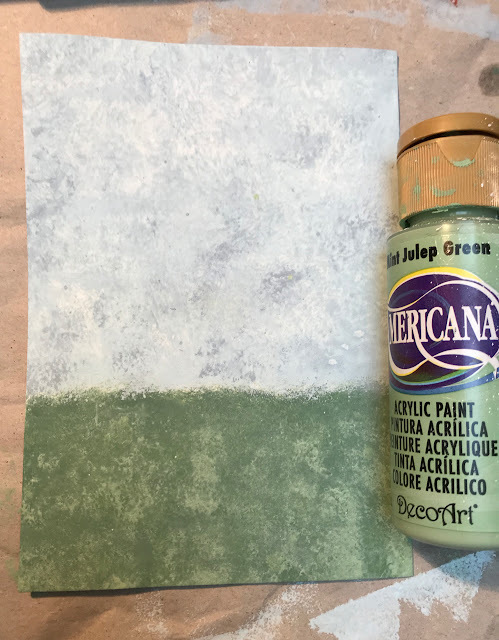 For the background, I cut out a 300gsm watercolour paper, then I coloured a blue part for the sky and a green for the grass. I used the following DecoArt Americana paints: Blue Chiffon, Winter Blue, Foliage Green, Green Mist. 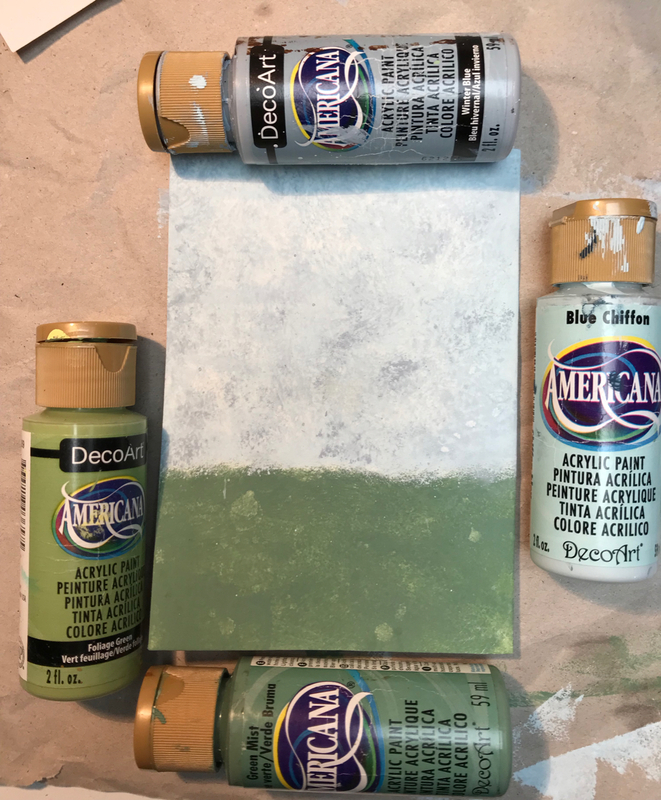 Then I added Mint Julep Green to soften the green part. The fence was painted with Pebble. When the fence was dry, I embossed it with the Lumber embossing folder. 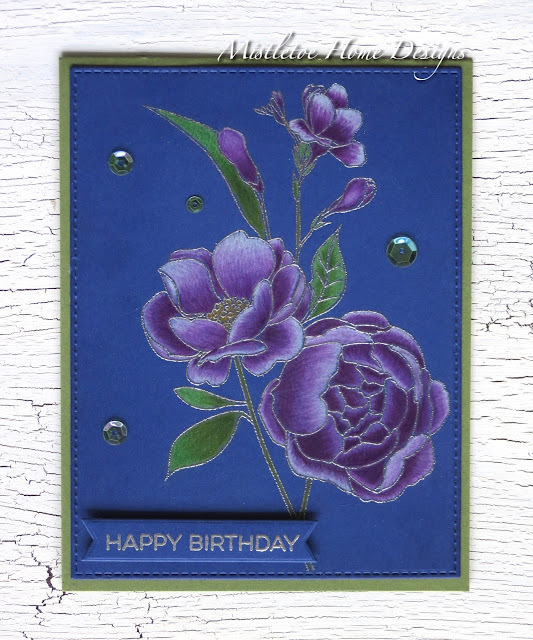 The sky was embossed with the Swirls embossing folder of the Burlap&Swirls set. 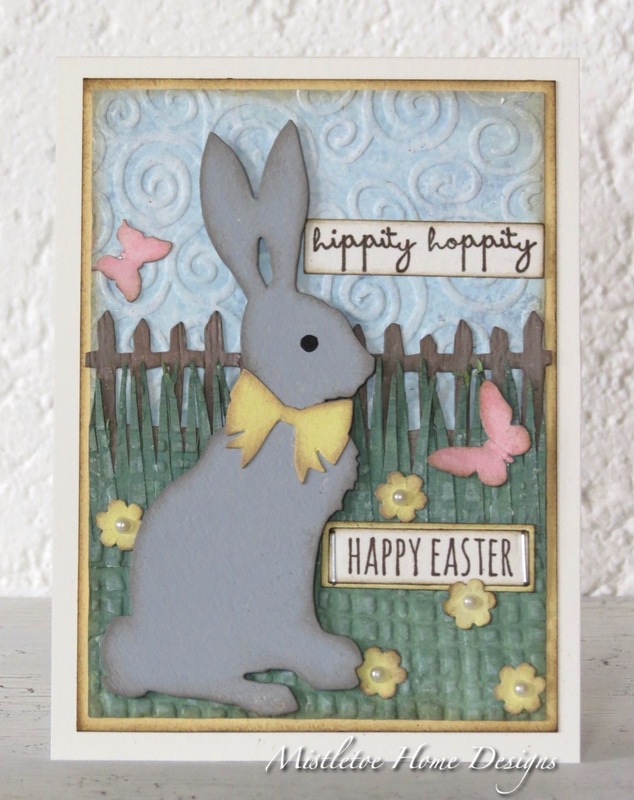 The grass cut out was painted with the same colours than the green part of the card, then I glued it on the card. When the glue was dry I embossed it with the Burlap embossing folder. After the embossing, I smeared Picket Fence Distress crayon onto the surface. I inked the edges with Walnut Stain Distress ink. The bunny was coloured with Grey Sky. 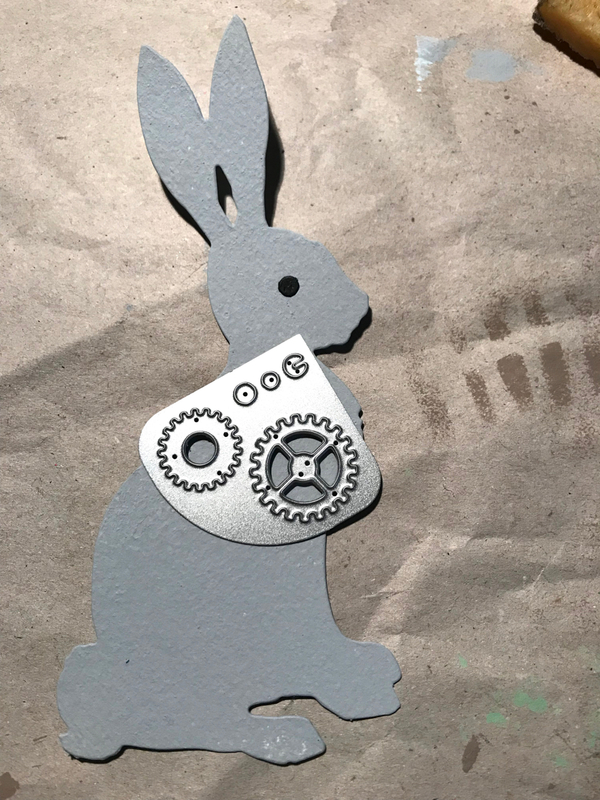 And I used one of the dies of the Robotic die set to make an eye for the bunny. I hope you like it!!! And if you have a project in the theme Easter and/or Spring, please don't hesitate to join our April challenge where you can win a £20 voucher. Here is the 4th version of the Fresh-Cut Flowers by me. In my earlier blogposts, you can find them. 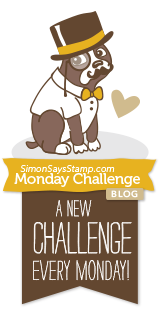 This one is made for the current Color Challenge of MFT, the 114th. 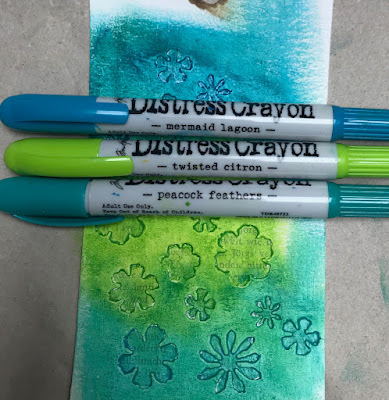 This time I chose the watercolour technique and the Distress markers, Picked Raspberry, Spun Sugar, Mowed Lawn, Squeezed Lemonade, Twisted Citron. 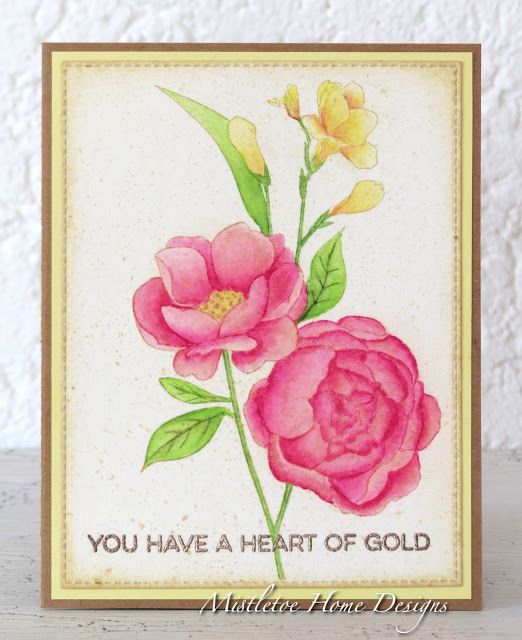 After colouring, I adhered diluted Antique Linen ink to the flowers using a brush. And I also spattered the card with diluted Antique Linen ink. 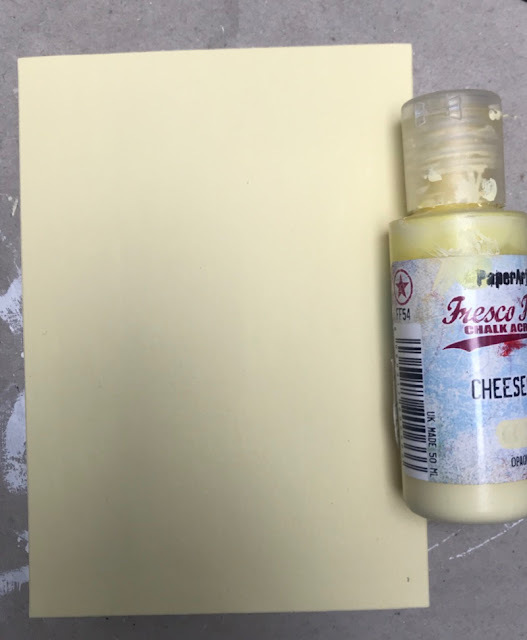 I inked the edges with the same ink using a sponge. The text is from the Essential Sentiments and heat embossed with Liquid Platinum. 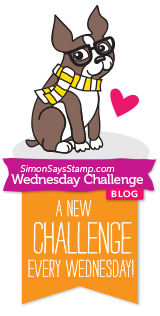 With my card, I would like to join the Simon Says Stamp Wednesday Challenge: Anything goes. Hello crafty friends, let me show you my version with Tim Holtz Cottontail Sizzix Bigz die. This is my first project with this beautiful bunny but not the last, soon I will come with more creations in scheduled posts. 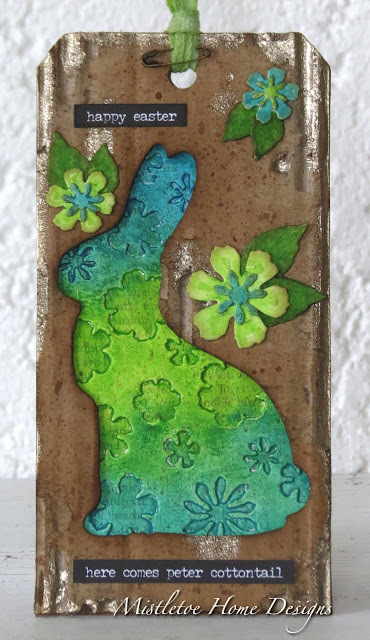 The first rectangle layer was coloured with PaperArtsy Cheesecake Fresco paint. Then I embossed with Tim Holtz 3D Botanical embossing folder. 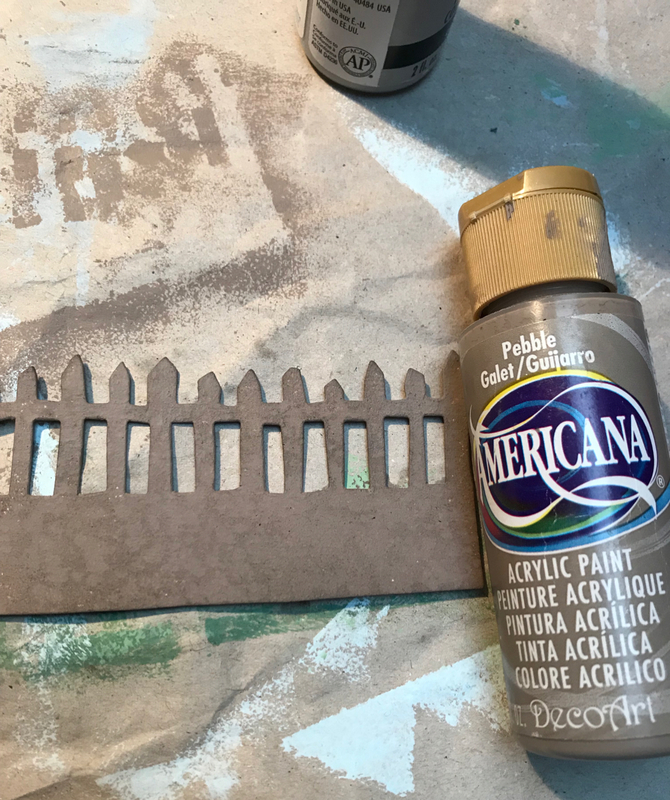 Then I smudged Picket Fence Distress crayon to the embossed parts. 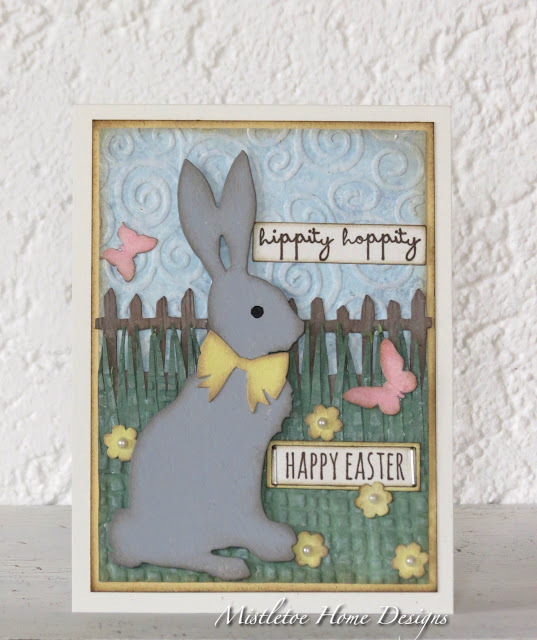 The second rectangle was coloured with DecoArt Americana Dove Grey paint. I inked the edges of both layers with Gathered Twigs Distress ink. The bunny was cut out from chipboard. 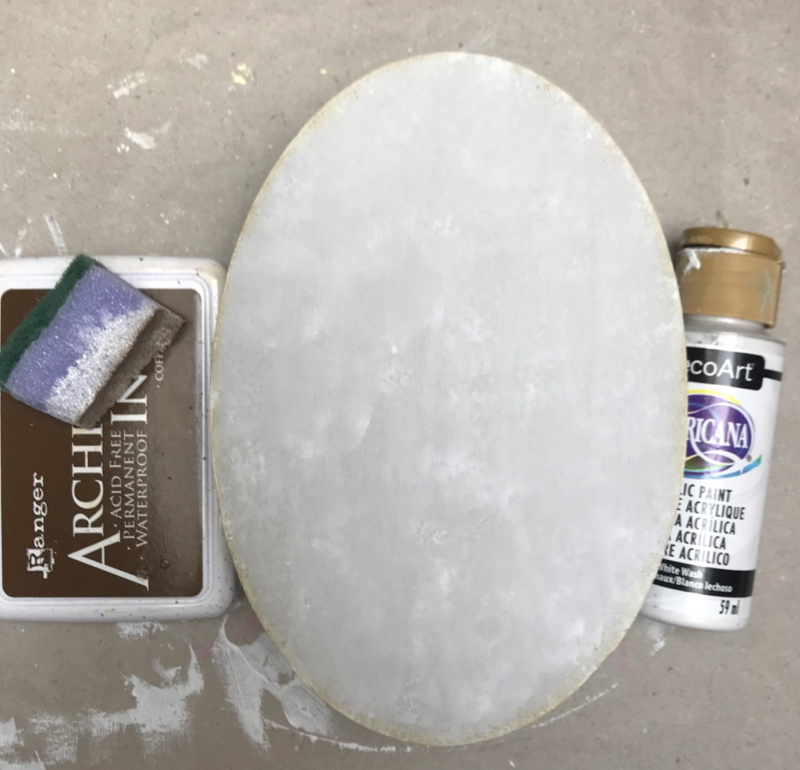 First, I put a layer of gesso, then two coats of white paint. The edges were inked with Gathered Twigs. To the bottom, I used a strip from a premade background that I didn't use so far. 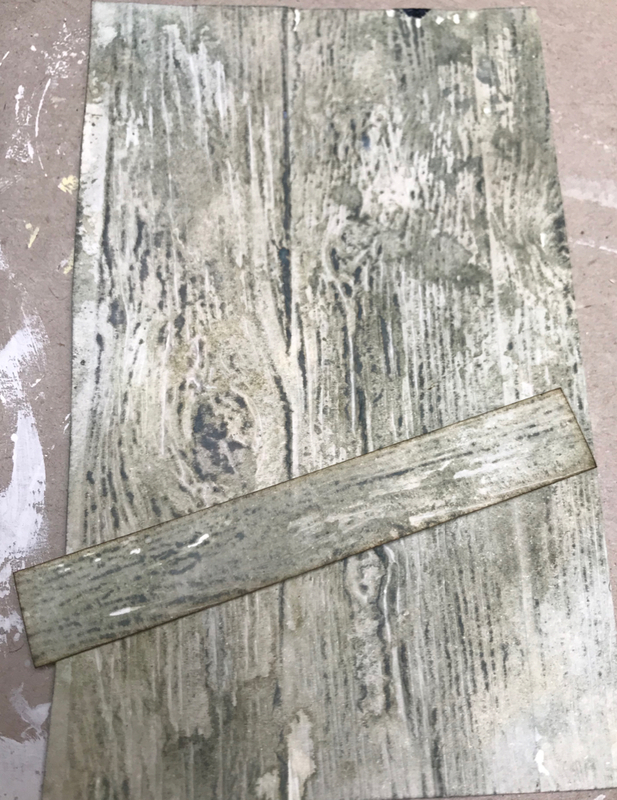 For this background, I used Tim Holtz 3D Lumber embossing folder and I think I coloured the same way as Tim Holtz when he was making the Village Manor in a youtube video. From 22.50 you can find that part. 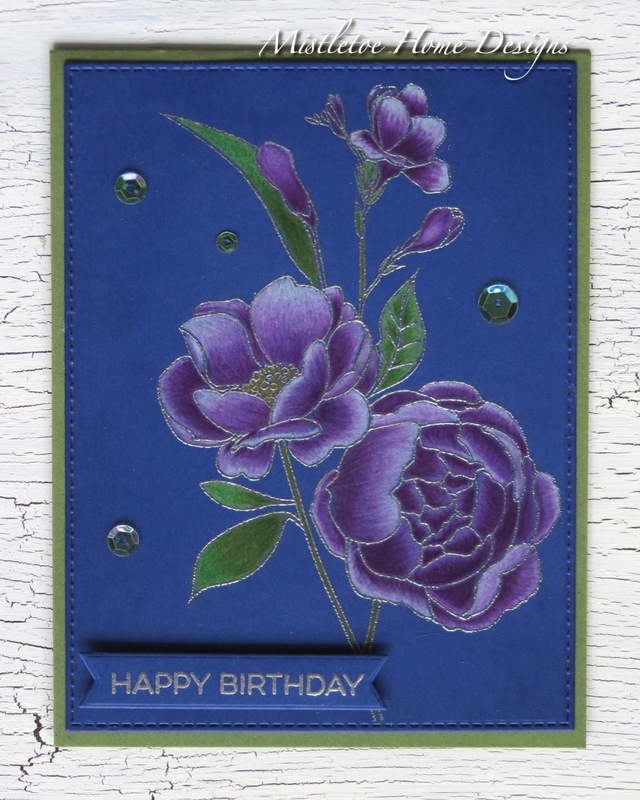 For the flowers, I used the Sizzix Wildflowers 1 and the Funky Florals 1 and cut them out from coloured cardstocks. 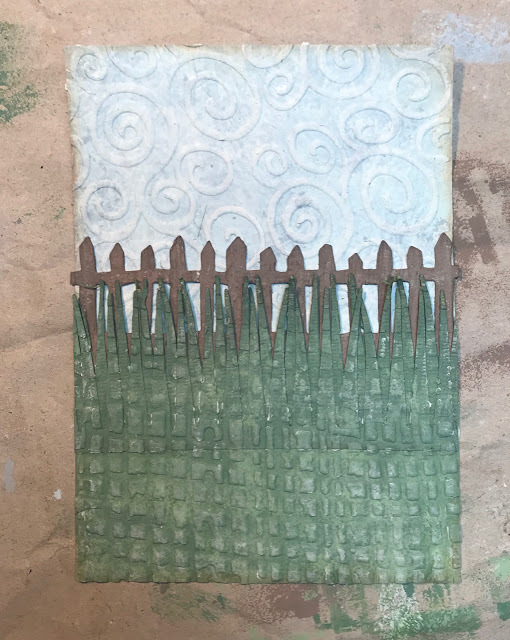 Then I inked the edges with Gathered Twigs and smeared some Picket Fence crayon to tone them back. 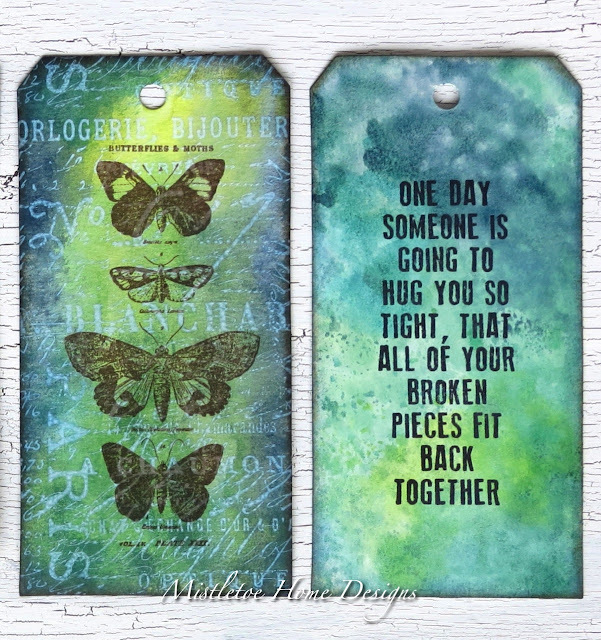 The text is part of the Stampers Anonymous Crazy Talk set and was stamped with Ranger Coffe Archival ink. I'm still playing with my new MFT Fresh-Cut Flowers. 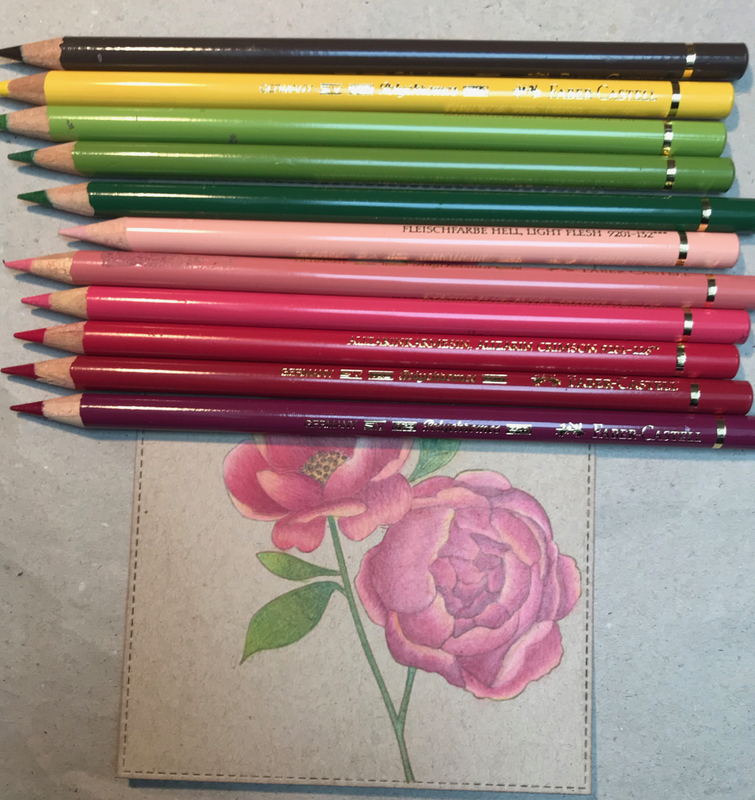 The last time I coloured them with Schmincke Horadam Aquarelle colours (you can see it here), but on this card, I used Faber-Castell Polychromos pencils. 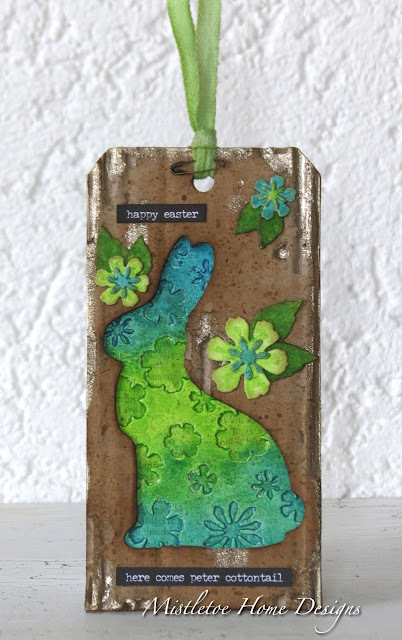 I stamped the image with MFT Hybrid ink (Latte) on Neenah Desert Storm (110lb) paper. 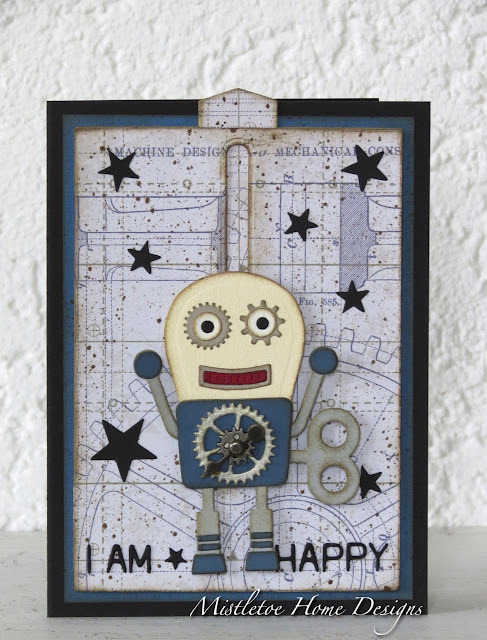 The paper was cut out with Die-Namics, A2 Stitched Rectangle. Then I coloured the following Polychromos pencils: Walnut Brown, Cadmium Yellow, May Green, Earth Green Yellowish, Permanent Green Olive, Light Flesh, Medium Flesh, Rose Carmine, Alizarin Crimson, Dark Red, Magenta. The text is part of the Essential Sentiments set and was stamped with Chocolate Hybrid ink and cut out with Die-Namics Fishtail Sentiment Strip. In the end, I sprayed the card with a fixative. P.S. Woohoo!!! 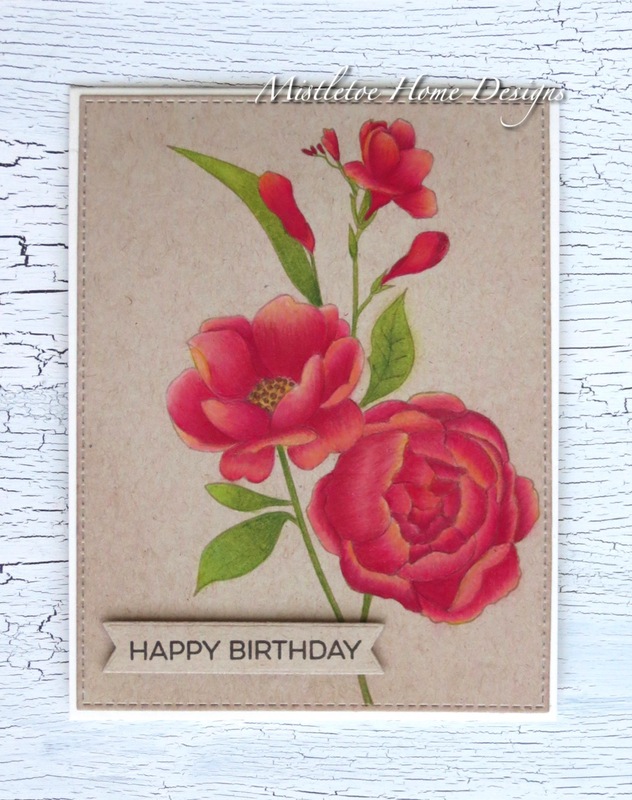 My card was spotted on the MFT Challenge Blog!!! Thank you so much, MFT!!! 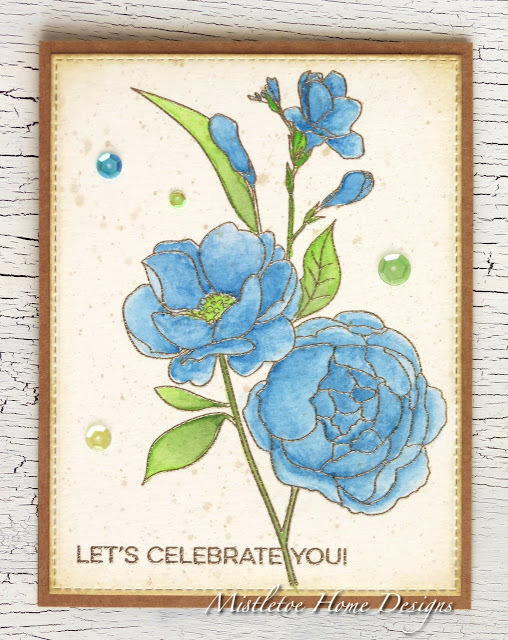 Hello everyone, here is my latest card that I made for the My Favorite Things Color Challenge 113. 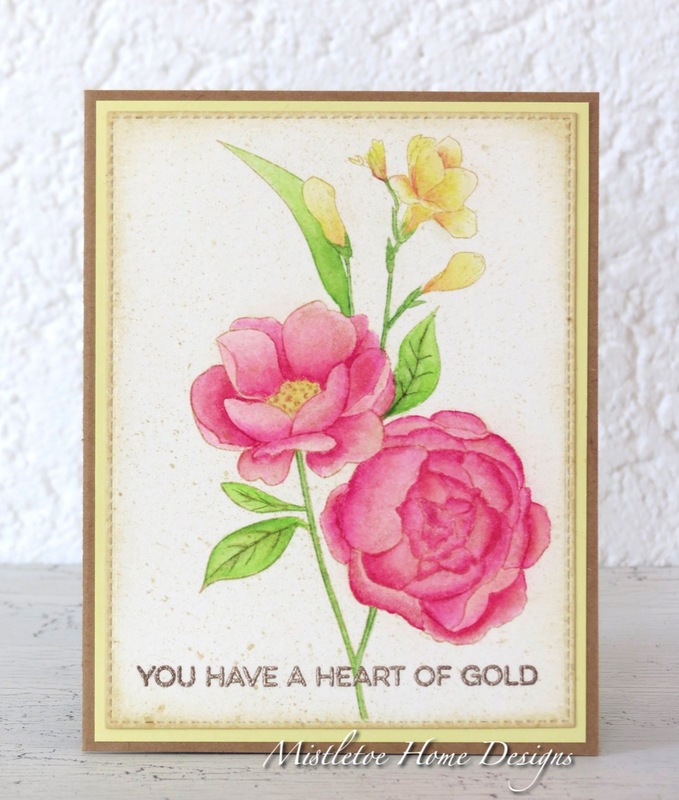 The flower and the text were stamped and heat embossed with Liquid Platinum. Then I coloured the flowers with watercolour technique using the Schmincke Horadam Aquarell pans and a fine brush. I spattered them with diluted Natural and Kraft ink. 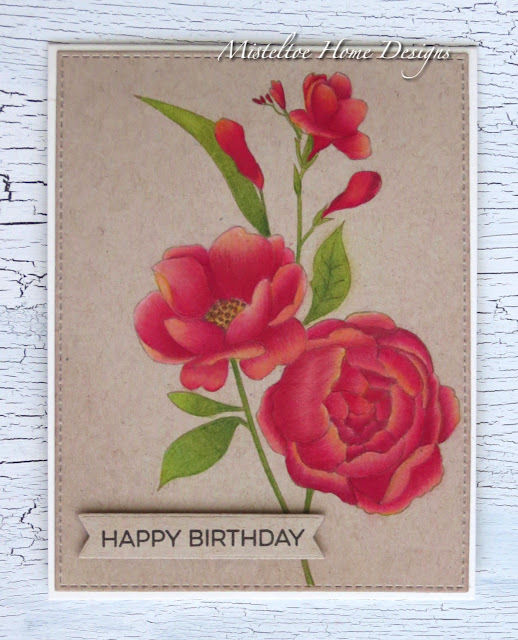 The edges were inked with Ranger Distress Antique Linen and MFT Kraft inks. The sequins were attached with Ranger Multi Medium Matte.